Poised over the bustling Hillcrest nexus of Fourth and University, Martinis offers over 100 twists on this iconic beverage. The place is upscale without being sterile or uptight, but purists be warned: many of the bar’s martinis are vodka-based. 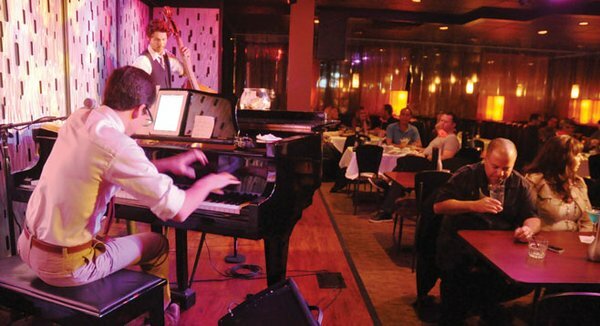 There’s a swanky lounge vibe with live piano entertainment Thursday–Saturday and a breezy outdoor patio. This cocktail club is best approached during happy hour. Sunday 4-7pm: $5 beer, $6 wine, $8 cocktails, $10 8-oz martinis. Appetizers $6-$13. Monday 4-close: $5 beer, $6 wine, $8 cocktails, $10 8-oz martinis. Appetizers $6-$13. Tuesday 4-7pm: $5 beer, $6 wine, $8 cocktails, $10 8-oz martinis. Appetizers $6-$13. Wednesday 4-7pm: $5 beer, $6 wine, $8 cocktails, $10 8-oz martinis. Appetizers $6-$13. Thursday 4-7pm: $5 beer, $6 wine, $8 cocktails, $10 8-oz martinis. Appetizers $6-$13. Friday 4-7pm: $5 beer, $6 wine, $8 cocktails, $10 8-oz martinis. Appetizers $6-$13. Saturday 4-7pm: $5 beer, $6 wine, $8 cocktails, $10 8-oz martinis. Appetizers $6-$13.